This recipe for Bacon Wrapped Barbecue Chicken started off by just wrapping bacon around a chicken breast and baking it. We absolutely loved it, I mean who wouldn’t? One night my husband Ken put barbecue sauce on it and it tasted even better! 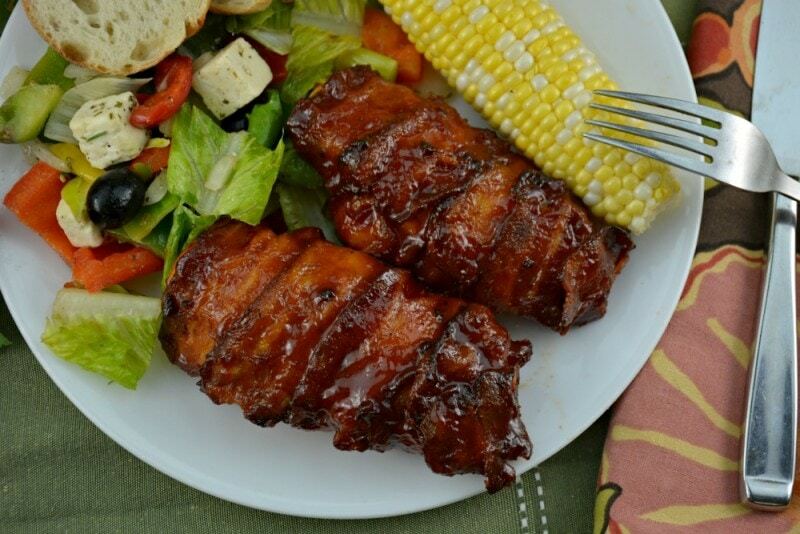 Now we make these Bacon Wrapped Barbecue Chicken breasts all the time. Bacon does make everything taste better and in this case barbecue sauce does too! 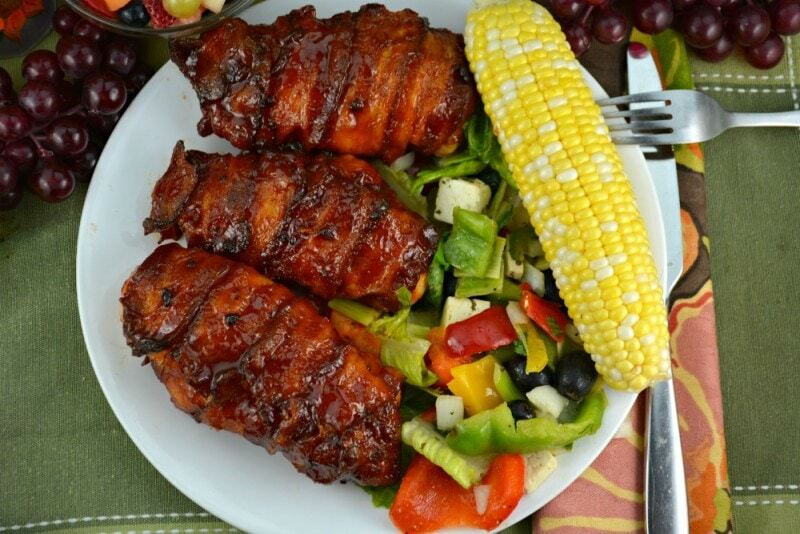 My husband adores this Bacon Wrapped Barbecue Chicken recipe and makes it every chance he gets. He found this maple bacon barbecue sauce and ever since then that is the barbecue sauce he prefers to use each time we make this chicken. Use your favorite brand or variety as they all will work beautifully! This Bacon Wrapped Barbecue Chicken breast is so easy to make and is a perfect dinner option for any day of the week! The preparation time is exceptional, really! 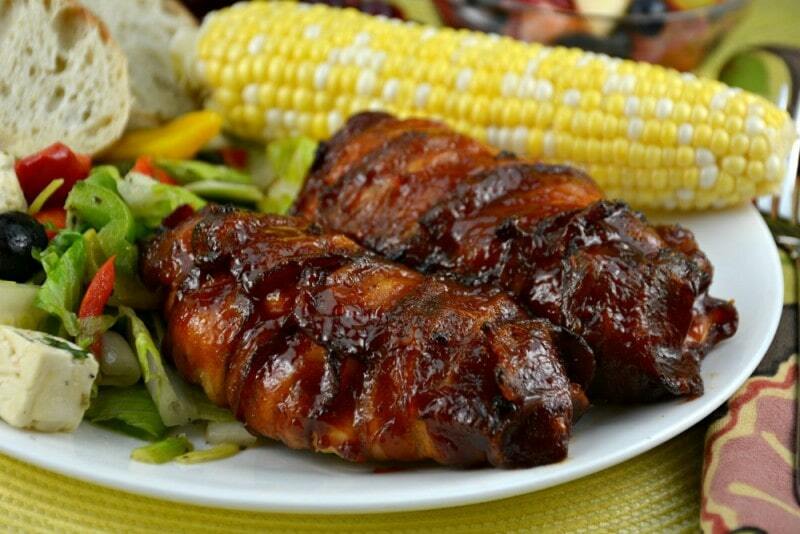 You just cook the bacon for a few minutes, wrap the chicken and bake it, add the barbecue sauce and bake again! It doesn’t get any easier than that! While the chicken is baking you have lots of time to prepare whatever side dish you are serving with it! 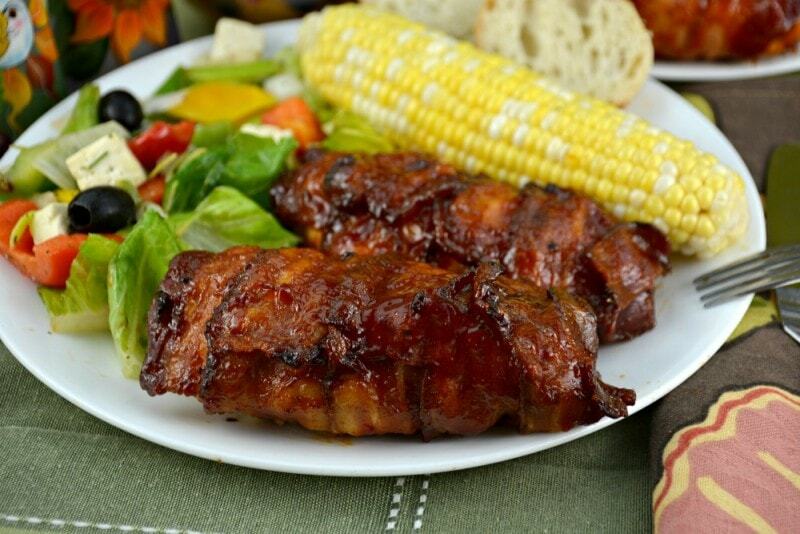 We love wrapping bacon around everything from these Bacon Wrapped Barbecue Chicken breasts to our Bacon Wrapped Garlic Chicken Thighs or Bacon Wrapped Cheese Biscuits or Sweet Sriracha or Sweet Chili Bacon Wrapped Shrimp or The Best Bacon Wrapped Pork Meatloaf or Bacon Wrapped Asparagus and the list could go on! My husband especially has tried wrapping bacon around everything he can think of! 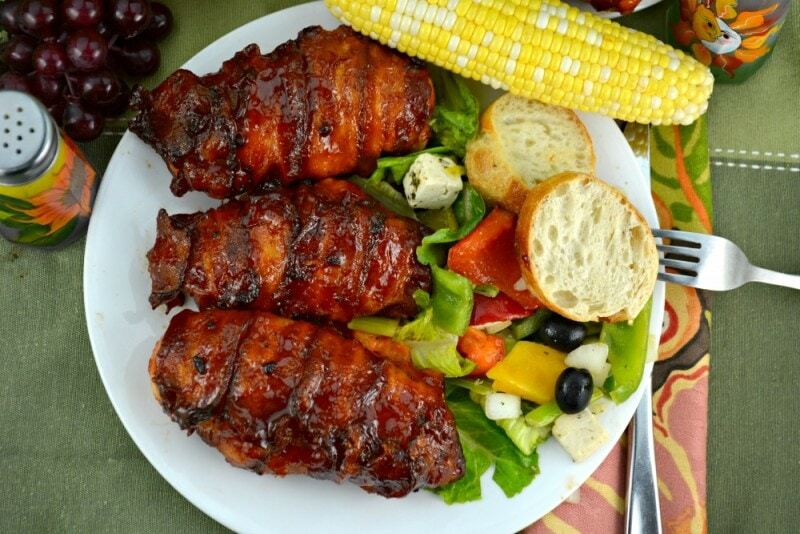 We tried repeatedly, in every way we could think of, to make these Bacon Wrapped Barbecue Chicken breasts without having to par cook the bacon first and we just couldn’t figure out how to do it without drying out the chicken breast itself and who wants that? This method works perfectly, every time! 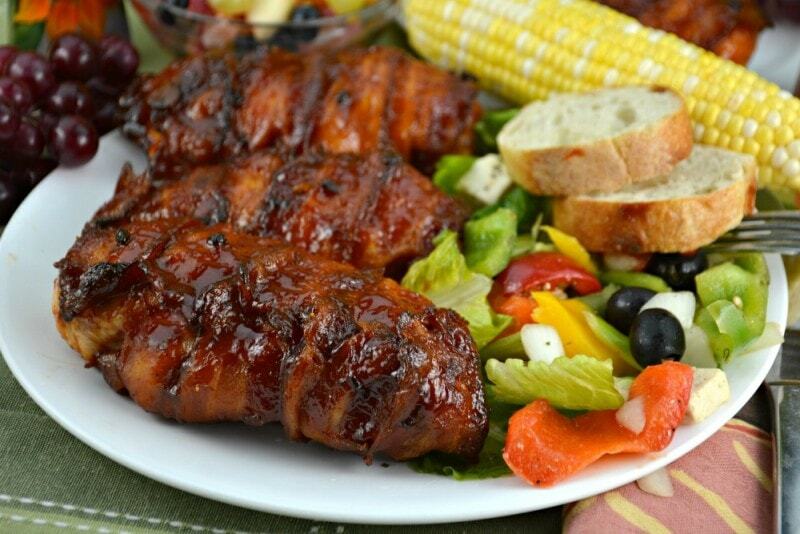 This recipe Bacon Wrapped Barbecue Chicken is such a crowd pleaser, each time I serve it! Both family and friends always enjoy the result and I have never had any leftovers. I have to tell you that my son always keeps one of these Bacon Wrapped Barbecue Chicken breasts for his lunch the next day. He puts it in a bun and makes a sandwich for himself and loves it! So I guess that is like having leftovers! Just in case this chicken dish isn’t for you I have listed some others below you just might want to have a look at. You can never have too many chicken recipes. Hopefully you will enjoy them as much as we do! 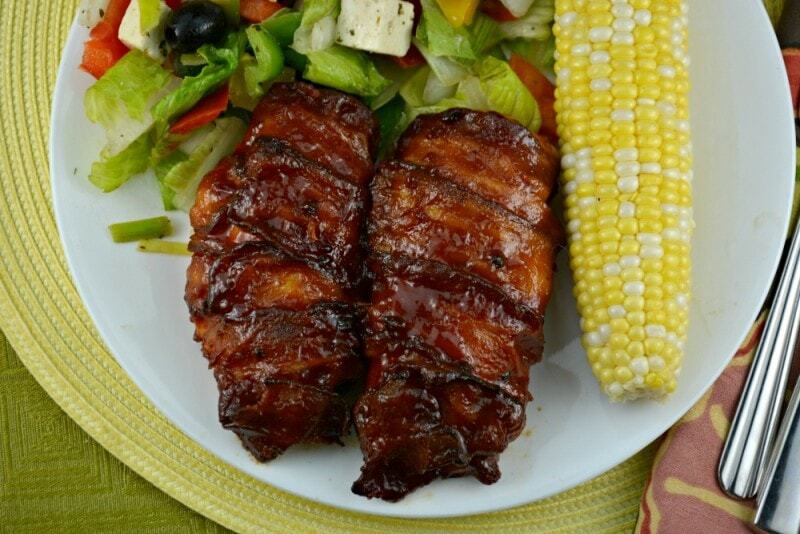 If you have a moment take a look at our video below for Bacon Wrapped Barbecue Chicken. I thin you will be glad you did! Preheat oven to 350 degrees. Prepare a rimmed baking sheet with tinfoil and a rack coated in cooking spray. Set aside. Cook bacon in a skillet over medium heat until the edges begin to crisp, about 5 minutes. Drain bacon on paper towels. Wrap each chicken breast with 2 to 3 slices of bacon, using toothpicks if necessary, and place onto the prepared baking sheet. Try to stretch bacon so the ends are underneath the chicken breast. Bake for 30 minutes. Paint a generous amount of barbeque sauce all over the chicken breasts and bake until the juices run clear and the chicken is no longer pink inside, between 10 and 15 more minutes. Turn oven to broil for the last few minutes to crisp up the bacon if necessary. Serve and enjoy! Yummy chicken. I loved how simple it was to prepare too. Thanks for sharing your recipe.